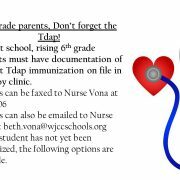 T-Dap Information for Rising 6th Grade Students: Click for more info. https://wjccschools.org/hms/wp-content/uploads/sites/6/2018/07/T-Dap.jpg 720 1280 Jessica Ellison https://wjccschools.org/hms/wp-content/uploads/sites/6/2014/05/logo.png Jessica Ellison2018-07-18 11:31:072018-09-16 17:31:39T-Dap Information for Rising 6th Grade Students: Click for more info. If your student has medication in clinic, please remember to pick it up prior to the end of the school year. Nurse Vona is not allowed to send medications home with students. Nurse Vona will be in clinic from 7:30 to 3:30 through June 20th. Any medication not picked up prior to June 21st will be discarded. Thank you and have a healthy summer!